Marcie’s a trouble maker. Robbie is wild. Breaking into their ancestor’s tombstone, they unearth a treasure map that kick starts them into a fantasy world fueled by their grandparent’s Irish stories. Meet mischievous Marcie, part of a family with large secrets. Trying to make sense of her mother’s crazed actions, Marcie looks to her strange cousin Robbie and the adults around her for direction. After dead Uncle Charlie’s funeral, they embark on a quest to find answers to questions that have puzzled their family since the Civil War. Sifting through lies, secrets, and Irish folk tales, Marcie believes “The Screaming Stone” contains the magic to uncover the truth and lead them to the hidden treasure. You’ll have to read “The Screaming Stone” yourself to find out what treasure they really find. 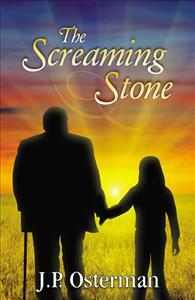 If you’ve just picked up The Screaming Stone, you are in for a fun and intriguing ride! Teenage Marcie her cousin Robbie stumble across a mysterious key in the family’s cemetery plot. Along with the key comes a cryptic poem with instructions to find a treasure. Together with Marcie’s younger brother Frankie, the kids embark on a hunt not only for the treasure, but also to gain some answers to family secrets and an understanding of why their family members act the way they do. When their beloved grandfather steps in to help with the search, he sheds some light on questions and problems that have plagued the family for years. J.P. Osterman tells an engaging story, full of Irish folklore and family secrets, that has you turning pages and staying up into the night eager to find out what happens next!